Dollar Tree how a love Thee, for so many reasons. Today it’s for these reusable 2.3 ounce containers with lids that are 10 for $1! Add some coconut oil, brown sugar, and essential oil and thanks to this Dollar Tree DIY, you’ve got a cheap and easy DIY sugar scrub recipe that makes a thoughtful gift for 10 friends. 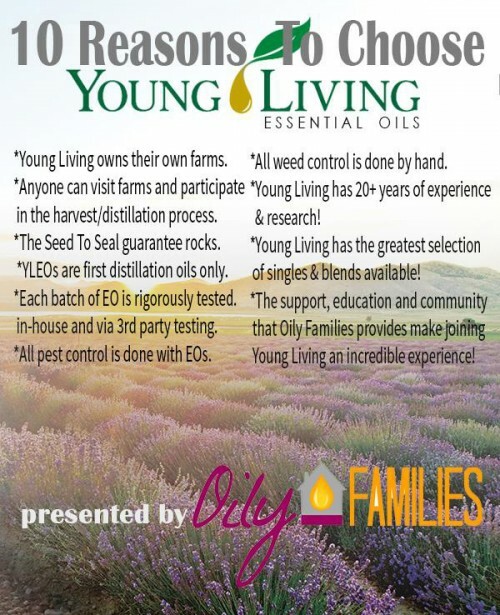 Tonight I attended a Young Living Essential Oils Class and was able to give all 10 attendees a little take home. These containers hold just the right amount for a foot, hand, face, or lip scrub. 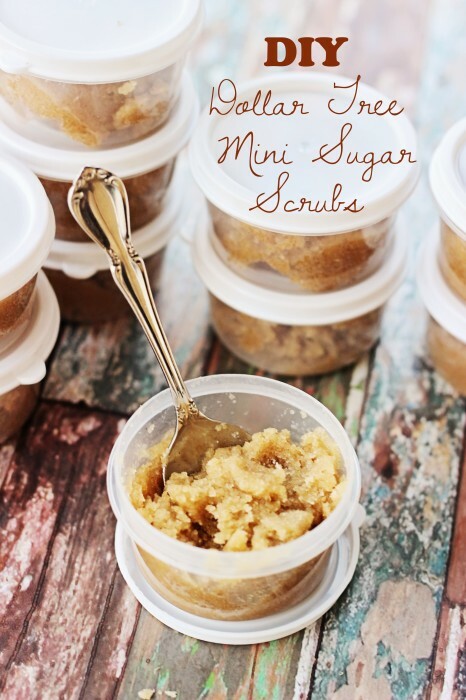 If you teach essential oil classes and like to have something to give as a door prize, this sugar scrub recipe is a simple way to do that. Alternately, this Dollar Tree DIY is cheap enough to make an appearance at a make-and-take class! 2. 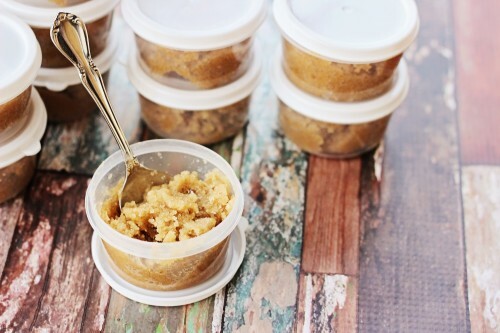 Pack sugar scrub into containers. 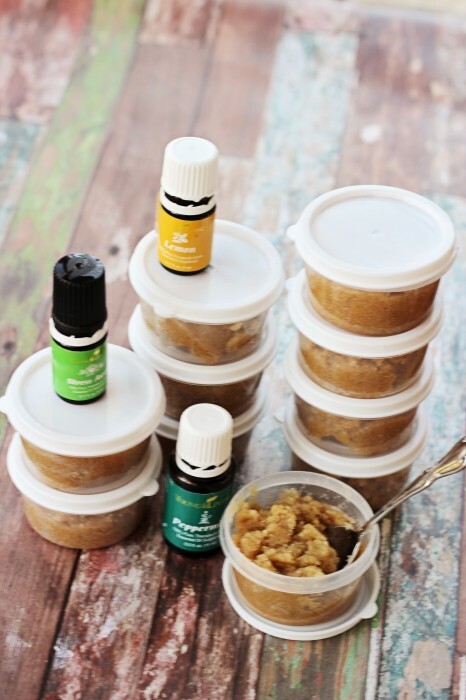 Since essential oils are not supposed to be stored in plastic long-term, I gave out the scrubs without essential oil and instructed each oily friend to mix in one drop of their favorite oil just before use. If you’re making the entire batch for yourself you can mix in 10 drops of essential oil and store it in a Mason jar in a dark place. Alternatively you can make up 10 for yourself and add one drop of whichever essential oil your prefer just before use. It’s like having access to 10 different scrubs! 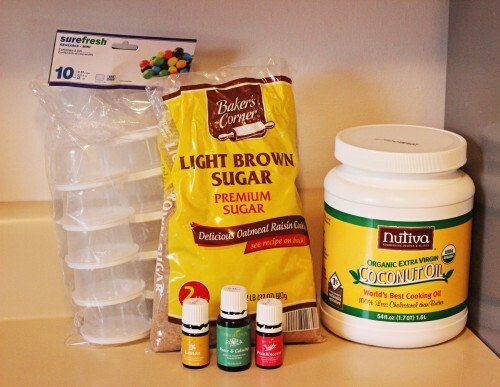 Pack sugar scrub into containers. *If you're making all 10 with the same essential oil, you can add 10 drops and mix before packing the containers. If you want a variety of fragrances, add one drop per container after you've already placed the oil/sugar mixture into containers. *For maximum benefits, use Young Living 100% pure therapeutic-grade essential oils. Questions? Send me an email at [email protected] I love to chat oils! 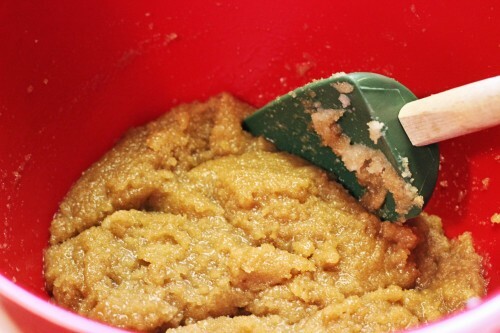 You might also like this DIY microdermabrasion paste recipe too.